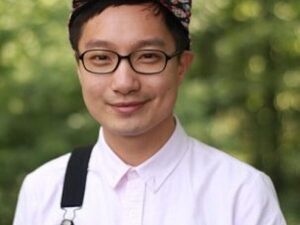 Chen Chen is the author of When I Grow Up I Want to Be a List of Further Possibilities, which won the A. Poulin Jr. Poetry Prize, Thom Gunn Award for Gay Poetry, and the GLCA New Writers Award. Longlisted for the National Book Award, When I Grow Up I Want to Be a List of Further Possibilities, was also a finalist for the Lambda Literary Award for Gay Poetry, and was named one of the best of 2017 by the Brooklyn Rail, Entropy, Library Journal, and others. His work has appeared in many publications, including Poetry, Tin House, Poem-a-Day, The Best American Poetry, and others. Recently, his work has been translated into French, Greek, Spanish, and Russian. Poets & Writers Magazine featured him in their Inspiration Issue as one of "Ten Poets Who Will Change the World." He has received fellowships from Kundiman, Lambda Literary, and the Saltonstall Foundation. *This reading is cosponsored by OSLAM.